Bev's and your next stop will be Clare. There are 31 blogs participating in the hop, and you will find some great prizes along the way. You must comment on THAT blog post to be eligible to win that prize. There are also some Grand Prizes posted on the Scrap-Mart blog. You must comment on EVERY blog throughout the hop to be eligible for the Grand Prizes. Comments will remain open until midnight CST on Sunday, December 5th. Winners will be chosen at random for each individual prize and will be announced on the Scrap-Mart blog on Friday, December 10th. You may only win once. Scrap-Mart would like to thank these sponsors for generously donating all the prizes for this hop: Making Memories, Spellbinders, JustRite Stampers, Sizzix, Heartfelt Creations, Lifestyle Crafts, The Stamps of Life, Boss Kut, Unity Stamps, October Afternoon, Copic, Silhouette America. Each year I try to make Christmas cards for my mom and dad to send out to family and friends. This year I managed to squeeze in some time to make some personalized ones for them. They need about 40 cards and I'm not a big fan of mass production, though in the interest of time, I came up with a simple design, used some different patterned papers and made 4 different varieties. To make the custom label, I used some of my favorite JustRite Stampers. 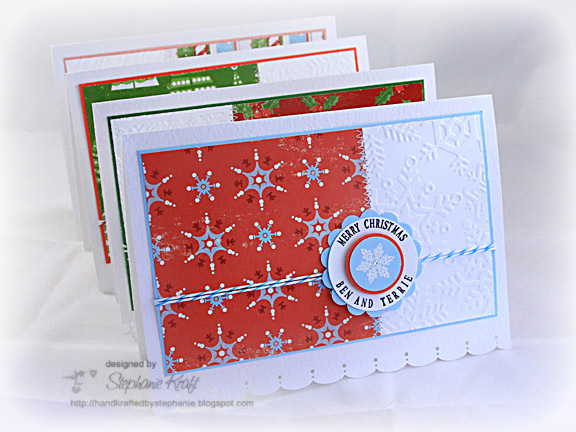 I started by stamping Merry Christmas (from JustRite Stampers Celebrations Demi Phrases) - the entire phrase read "Wishing You a Merry Christmas". I then wrote out my parents' names (Ben and Terrie) using the Times Roman 15 pt Font Set. 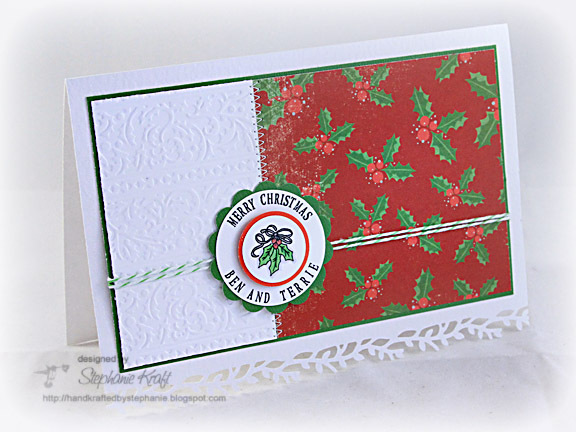 For the center images, I used Holiday Cheer Borders & Centers. In the card above, I stamped the holly and leaves and colored with Copic markers and a couple of Spica glitter pens. In the card below, I simply embossed the snowflake with white embossing powder and added a crystal twinkle in the center. All patterned papers are from Making Memories, Tinsel. I also used a few different embossing folders and colors of Divine Twine. Here's the entire hop list.. Happy Hopping! Accessories: Embossing folders: Candy Cane Stripe, Snowflakes, Holly Ribbons (Provo Craft); Divine Twine, Crystal Twinkles (Taylored Expressions), White embossing powder, Foam tape, Thread, Sewing machine. Darling cards, Stephanie -- I'm sure your parents will love sending them out and really appreciate all your had work! Love your cards, and that twine rocks! Love the bakers twine on your cards. It adds such a small but impactful detail. What a great idea!!! Your cards are wonderful...and I love the personalization! Thanks so much for joining us for our very firt blog hop! Love the cards, simple and elegant and the twine makes it just right. Thank you for sharing your project. Love how you added the baker's twine! Thanks for sharing! 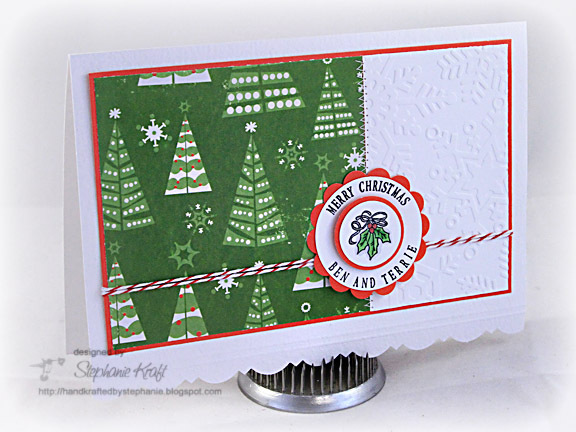 You gave me a cute idea to use with my embossing machine! I think your cards are the cutest I've seen so far! I am so impressed by your generosity! That must have taken a while and is such a kind thing to do! Dang... now I need an embossing machine as well. I LOVE this look! Love these cards. Especially love the embossing! What a great way to make a stack of Christmas cards. I love the embossing!! Gorgeous cards! ok, i am officially in love with those cards - and how smart to change it up just a bit for four designs!! I love the detail at the bottom of the first one! I love how each card is the same but different. Great job. Adorable grouping of cards. Just love the variety! I hope your parents know that you are the best daughter ever. That is unbelievable that you make them homemade cards . . . and they are spectacular to boot. Thanks for sharing. I love what you've done with the embossing powder! Beautiful! These cards are beautiful! Anyone would be thrilled to get them in the mail! Cute cards, I love the twine, need to use mine. Such perfect mailable christmas cards! Love it! All I can say is WOW! These are BEAUTIFUL cards! These are cute and they don't look like assembly line cards. Great job! Your cards are so bright and cheery. I love them...also recognize some of your papers....wonderful job.. Perfect examples!! I loved every card. I love the simplicity and textures!! Gorgeous!! those are beautiful! love the embossed snowflakes (and the embossing in general, really) and the bakers twine. great job! These cards are so adorable. Love them! Love this idea for using patterned paper. those cards are so cute! makes me want to go get out all my scrapbook stuff and scrap!! You are such a wonderful daughter to do that for your parents...all of your cards look great! I love the embossing and the bottom border punching on the one! Very nice!! Good job - love 'em! I love them all .. can't say I have a favorite! I really like how crisp and clean the colors are these cards. What a better way to let someone know you care about them then personalizing their card. I love that little detail. Beautiful cards! What a fun blog-hop! your cards are so pretty - classic looking! Wow! personalized cards what a great idea! Holy smokes that's a lot of cards to make! I really like the play of many different things going on without being over done. Beautiful design! Nice way to make a group of cards similar, yet different! Love the clean lines and color combos! what a simple, yet elegant card. i may have to "borrow" this idea and make some for myself! thank you so much for sharing! Stephanie, I just love your personalized cards! Great looking cards. I love the different bottom edge on each one. What a great idea! Love the mediallion in the middle with your folks names on it -- how nice and personal! I love these cards. This is a great template for other cards as well. These cards look great! I really am in love with the embossing. Great cards. I'm thinking about making homemade cards this year. This post just inspired me to get started! Really great ideas you have!! So many things for me to learn on your blog! Very pretty cards, lovely inspiration. Thanks for sharing! Some of the most beautiful cards I've seen this year!!! Love the clean look to your cards. Nice job! Great cards. Love all the gorgeous cards. Those cards are just too cute! That's a great idea--to scraplift yourself and not get bored with them. Very cute cards. I love your cards and the personalized sentiment.. it is a great idea! Thanks for sharing! What would we do without embossing folders!?!?!?! I love them and love the cards you created. I'm overwhelmed, I really am! You guys are all fantastic for putting this all together and sharing so much information. Super cute! I love the idea of personalizing the cards! Great set of cards, clean and simple. Just how I like them. What a great collection of cards !! Beautiful cards - the embossing adds so much. Very nice cards, and so good you could mix it up a little and still keep up with making that many! I love bog hops. thanks for being part of this one! Simple, but still very nice. I think that the embossing really adds a nice touch. Cute cards love the designs. Similar but each unique. Thanks for sharing and I am sure your parents and their recipients will be happy. oh man..those scalloped edges are fantastic!!!!!!! Lovely cards, Stephanie, and sooo nice they are personalized too! Know they'll really be proud to send these out!!! I have this MM paper pack & LOVE it!!! I love the cards! simply gorgeous. All of the cards are simply wonderful! I am sure your parents will be proud to send them out! Very cute cards! I love the papers you used! what a good daughter you are for doing this for your parents...really lovely cards - great job! you get a huge gold star from me! I don't like doing mass produced cards either, lol! These are awesome cards though and your parents must love having their very own personalized Christmas cards to send out! I absolutely love those cards. Mass production is so hard to do. Will maybe steal some of your ideas they are great. Those are very professional looking! Job well done. not only a great idea but a wonderful gift for your parents. I think I should do this for my mother, she would love it. I love the embossing. It adds so much detail. I LOVE these cards, every one of them! You've made them special by personalizing each one - what a thoughtful thing to do for your parents! I love the patterns, white space and beautiful stitching along with the twine! Awesome!! love the individuality of each card and the ease of production. I love the way you put your cards together! Cute papers. That's a lot of work to make so many unique cards. I'm impressed. How thoughtful, for you do do these for your folks! They'll really appreciate how special they are. Cute papers and nice CAS design ~ love them! TFS! Lovely cards. What a fun hop! The personalization is so cute. Love it! Great cards. Thanks for reminding me how much the use of embossing can add to a design. Love your cards! Stopping in from the blog hop. I love the Christmas tree one! What a great idea! I love how you took the same general pattern and made such different cards. Love all the card ideas, so fun! I love you simple and yet elegant cards and the fact that they are personalized makes them very special. I'll have to put those stamps on my wish list. Wonderful job! Love your designs, the cardstock variety is awesome! Amazing cards. I love them!! Thanks for sharing :)! These are fabulous! And you are a wonderful daughter! I still need to make my cards. Cute! So fun & festive...I like 'em a lot! I think they look especially nice all stacked together. The texture + pattern paper is eye catching. Love the cards! Love the clean and simple design too! I think all those cards are wonderful and the personalization makes them even more special! Love the decorative edges of the cards. What a wonderful set of Christmas cards. Thanks for sharing!! I'm new to all of this and I'm loving the embossed look. Great projects. I LOVE those cards! Those are just my style! I'm trying to figure out how to incorporate some of those ideas into my own cards that are still in the design stage. so cute. I'm ready to dig in and get started, except I have about 100 ideas to try! I love how you varied the cards to make them so unique! Great job!!! I love those circle sentiment stamps!!! What a sweet daughter you are to make these beautiful cards for your parents. Love them! I love how personalized those cards are! Very pretty cards. Love the personalization. You parents must love these. Love the embossing stuff. I have a thing for embossing folders. Great cards. Great colors. Your cards are so sweet! love them! Thanks for sharing. Love the look that you created by carrying the pattern and string themes. Lovely. i'm loving how they are slightly different, but are totally "do-able". thanks for a great idea! I would choose them all, lol. They are all fabulous cards! wow, go you for making 40 cards for your parents to give out. amazing! Love what you did with the baker's twine! These are beautiful! You chose great patterns and beautiful colours! The edging on these cards is amazing! Loving all the great ideas I'm getting from this blog hop! These are so cute. I just ordered some stamps from Just Rite and can't wait to get them. I'm sure you'll parents will appreciate these. Darling cards! I love the candy can stripe card. Really love your cards. So clever to keep a main design and just change it up some so you can get a bunch done. I just love the punched edges on the front of the cards. Gives such a beautiful touch. I love the bottom of the cards! It adds so much character! Won't they feel super special sharing these with family and friends! Wonderful idea! So lovely! Thank you for sharing your talent with us! Beautiful holiday cards Stephanie, I'm sure your parents appreciate you taking the time to create them. Lovely design! I love the idea of the personalized tags. Absolutely love these cards. I love the punch on the first card and the use of the butchers twine. I saw that at Michaels and couldnt remember why I wanted it and now that I see it in use again I have to go get it!!! personalized cards are a great touch! I like this spin on mass production. Beautiful. Amazing Card ideas - loving the blog hop - thanks for sharing!